Home » Big Idea Tech Blog » Blog » Is your Business IT Prepared For Hurricane Season? In preparation for hurricane season, there are few steps your business should take to protect your data and technology from storm damage. 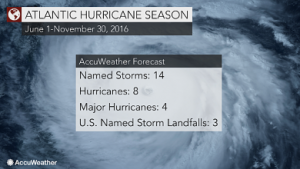 Though Atlantic Hurricane Season is not until June 1 through November 30, 2016, forecasters recently came out with their predictions for this year’s hurricane season, varying from “near-average” to “above-normal”. The forecasts are for 12-14 named storms, 5-8 hurricanes, and 2-4 major hurricanes, with 3 U.S. named storm landfalls. While we in the North-East rarely get hit, as many learned from Super-Storm Sandy, it only takes damage from one major storm to put your company out of business. Most people think of storm preparation in terms of stocking up on food, medications, toilet paper, batteries, and first aid kits, and possibly even evacuation. However, your business also needs to prepare your IT to weather the storms. You’ll need to ensure that you have a complete, restorable backup of your computer files and servers. We recommend a hybrid-cloud image-based backup that can be used to restore data and applications even if your server is destroyed, and that can restore data from different points in time. If your business still uses tape or other media backup, be sure to take the backup offsite. If your business is in a flood zone, you’ll need to protect your IT equipment. When a major storm is predicted, elevate your CPUs, printers, servers, and other network devices, as well as other electrical appliances like space heaters, off of the floor. For high winds, move computers away from windows. If there is a possibility of water leakage, cover computer equipment with plastic. Power outages and surges also cause issues for IT equipment. Your server and possibly computers should be plugged into a UPS – uninterruptible power supply – to allow them to keep running for a short time when the primary power source is lost. If, however, your business is vulnerable to storm surge and flooding, and if you don’t need your computers on for remote access, or if you use cloud software applications, you might consider turning off your computer equipment including printers, desktop computers, monitors and laptops. Ask your IT provider about shutting down your servers, and if they think it is necessary, they will shut them down in the proper sequence. Other technology that your IT provider might recommend unplugging includes your network switches, firewalls, routers, telephones, surge protectors and battery packs. If you disconnect cables, be sure to label everything so it will be plugged in properly after the storm. If you do unplug, expect it to take longer to get back online after the storm. What about continuing to do business after the storm? What if your office is damaged, or there is a prolonged power outage, or you aren’t able to return to the office due to flooding or downed trees? Make sure you have up-to-date documentation of your network and computer systems. Protect important documents such as legal contracts, insurance documents and tax returns to avoid water damage. Whether your business is server-based or cloud-based, be sure to take offsite a printed list of phone numbers and email addresses for all your contacts who are crucial to business operations, including suppliers, vendors, water, gas, electricity, mobile generators, staff and clients. Your business doesn’t need to go out of business as the result of a major storm. Big Idea Technology is committed to preparing our clients to protect their business, both in making sure they have the proper technology to meet their current and future needs, and in advising them about safeguarding their businesses from weather-related, cyber and other disasters. Call us to discuss how we can help your business.